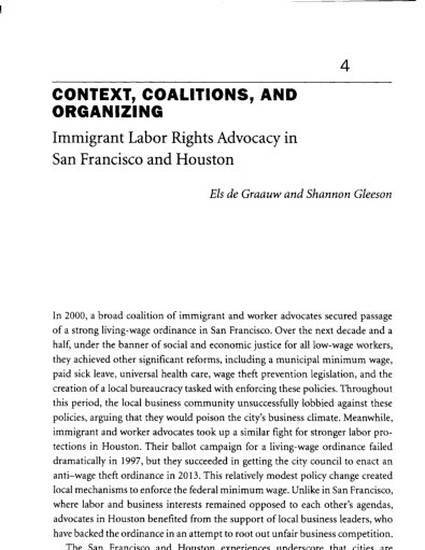 [Excerpt] In the pages that follow, we first situate immigrant labor rights struggles in scholarship on the “right to the city.” We then present San Francisco and Houston, focusing on their immigration histories, current demographic profiles, and contexts for advancing immigrant labor rights. We next describe the parallel types of organizations that have advocated for stronger wage and labor rights in San Francisco and Houston and the similar principles that have motivated them to advocate with local government. In discussing the wage and labor rights campaigns in each city, we draw out key differences in the policy changes that advocates have realized, the coalitions they formed to do so, and the issue frames they adopted in the process. The conclusion underscores the need for more research on how, and to what effect, advocates are mobilizing for immigrant labor rights in cities with different historical, economic, political, and demographic contexts. De Graauw, E., & Gleeson, S. (2017). Context, coalitions, and organizing: immigrant labor rights advocacy in San Francisco and Houston [Electronic version]. In M. Greenberg & P. Lewis (Eds. ), The city is the factory: New solidarities and spatial strategies in an urban age (pp. 80-98). Ithaca, NY: ILR Press, an imprint of Cornell University Press.